The Wood Workshop is a free seamless texture editor that specializes in the creation of seamless wood textures. It helps 3D artists of all types quickly and easily take their wood and floor textures to a new level of realism. Over 100 fully editable preset textures come included in the Wood Workshop. As well as being perfectly seamless, all textures are resolution-independent, allowing designers to simply re-render their textures at different sizes as requirements change. 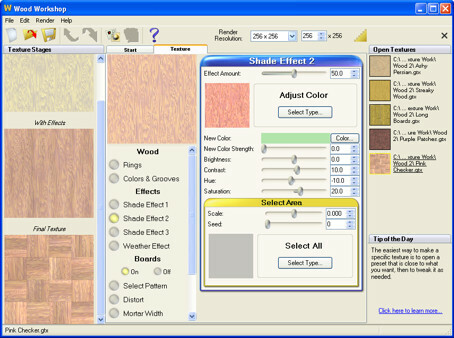 The program contains well over 200 sliders and selectable options, making it the most powerful wood texture generator you'll ever use. The Wood Workshop will not only create solid wood textures, but at the touch of a button will also transform your woods into a variety of floor board patterns for ultra-realistic floor and wall textures. Download now and see why this application has taken the 3D graphics community by storm!